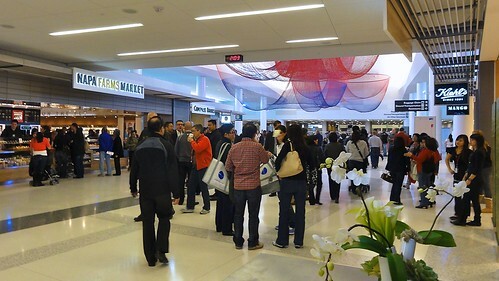 On Saturday afternoon Thom and I went to the community open house for the completely redesigned Terminal 2 at San Francisco International Airport. 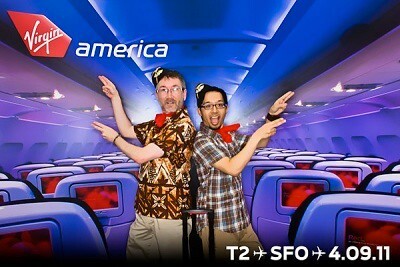 As a travel geek I was totally excited, and since T2 is the new home for Virgin America, as a VX loyalist I was doubly excited. This terminal is on the site of one of the original buildings at the airport and for several years served international flights. I remember coming here as a kid with my parents several times to drop off and pick up relatives traveling to and from the Philippines. 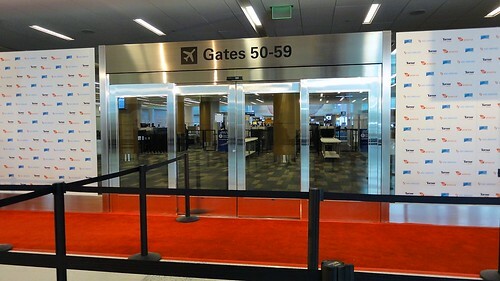 For a time you could go to the gates if you weren’t traveling, and I’d even bring a bag with me so that I could put it on the conveyer belt and run it through the X-ray machine at the security checkpoint. I was just fascinated by the whole airport experience. Travel geek in training! A detour: These are those kinds of moments when I miss my dad, who passed away almost five years ago now. He was an architect and was always interested in keeping track of new projects in the area, especially transportation infrastructure. So this was an event he would have loved. For example, several years ago he and my mom attended the groundbreaking for the Colma BART station near our house, and they were also at the opening of SFO’s new International Terminal. That sort of fascination has rubbed off on me. Back when I was living in D.C., one of the times I came back to visit my parents, I told my dad to pick me up not at the airport, but at a BART station along the then-new SFO extension, so that I could ride BART from the airport for the first time. He completely understood. OK, back to the open house. 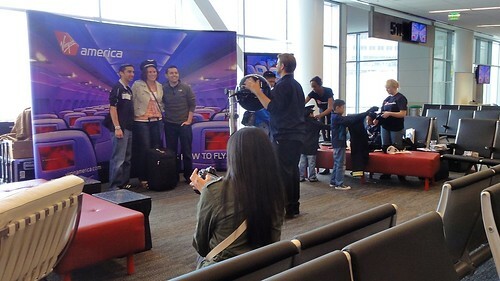 As I said, T2 is the new home for Virgin America, as well as for American Airlines. 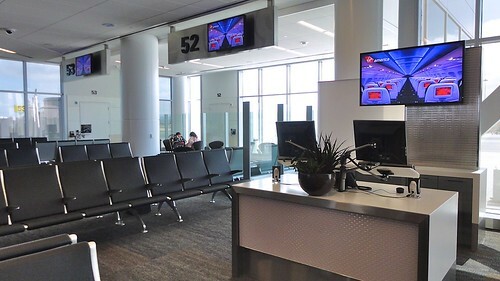 I will say that Virgin America’s previous location in the International Terminal was nice too and was actually easier to get to from the airport BART station. 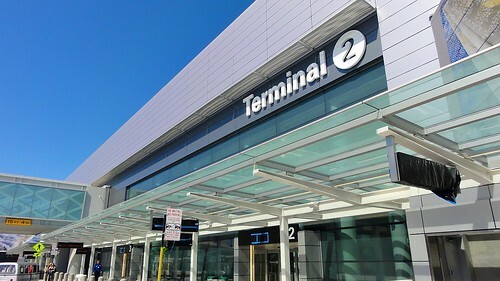 Now that they’re in T2, from BART you either have to connect to AirTrain or walk a long-ish way through Terminal 3. The terminal is chock-full of shops and restaurants on the way to the gates. (We stopped inside a bookstore to browse, and I had to fight the instinct to load up on magazines. Force of habit.) Overall I’m impressed with the terminal; it’s light and airy with lots of windows for planespotting, and plenty of good places to eat. However I’m not sure there is enough seating at each gate area. We shall see. 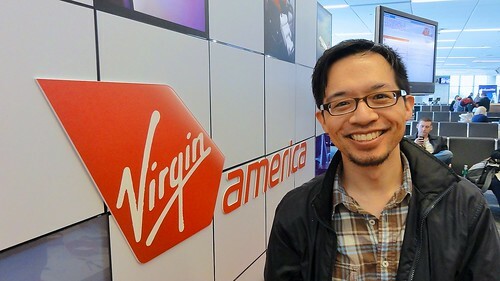 My next Virgin America flight may not be until August, so my first chance to actually use the terminal as a passenger will not be for a while. We were so on board with this. The lady with the props was like, do you want to be captains or flight attendants? Well, we couldn’t resist. We put on the little hats and red scarves and decided to do emergency-exit hands, and it’s hilarious how we instantly did the same Charlie’s Angels -like stance. Flight attendants, ready! Most of the other visitors’ portraits were kind of “normal,” so I think the staff got a kick out of us. Fun times. » See also: The rest of my photos from the T2 open house are up on Flickr. 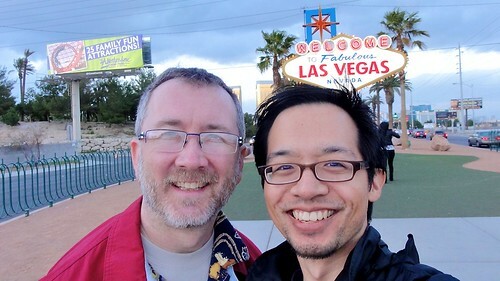 We were in Las Vegas for Valentine’s Week, and while I don’t have a full-on travel recap for you, you can view a slideshow of photos below or go to the Flickr set. 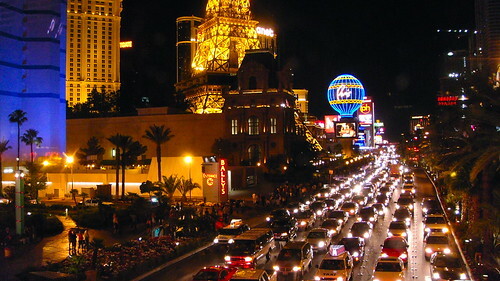 Our home for the week was the Encore, and while in town we saw three shows: Zumanity , Le Rêve , and The Beatles–LOVE . One day we drove out and took a tour of Hoover Dam. By the way, thanks again for your restaurant suggestions on Facebook and Twitter. We were able to fit in Raku (off the Strip) and Bradley Ogden (at Caesars Palace), among other places, and they were fantastic. Last year we went to Palm Springs for the first time, for Modernism Week (my Flickr photos are here), and this year we started planning to go back but then were tempted by a promo that Thom had received from the Wynn Las Vegas, which included midweek rooms for $99 (upgradeable upon booking) and two tickets to Le Rêve. We thought, why not? And make it a Valentine’s and anniversary kind of thing? The time around Valentine’s is one of our anniversaries. 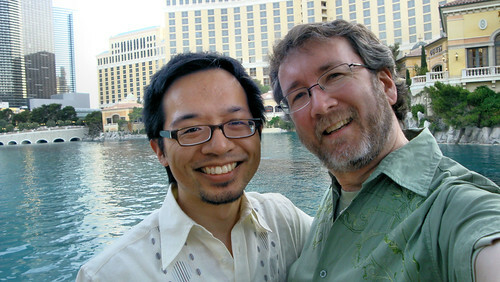 In 2009 we became domestic partners on February 13, and the next day we got engaged and had our wedding later that year. So we’re flying down to Vegas on Virgin America tomorrow, and our home for the next few days will be a resort suite at the Encore. We’ve also started filling our itinerary with more shows (Zumanity and The Beatles – LOVE) and restaurant reservations, thanks to your suggestions on Facebook and Twitter… and if you have more, please let us know. Have a happy Valentine’s Day! And as a side note, there are several community actions taking place on Valentine’s Day at county offices across the country to advocate for marriage equality. The one in San Francisco will take place from 11:00 a.m. to 1:00 p.m. at City Hall on the steps and inside the county clerk’s office. If you have time, do check it out and help raise awareness for LGBT rights. We leave for vacation today, so I guess it’s time for a preview! Over the next couple of weeks we will visit the Philippines, Cambodia (Siem Reap), and Thailand (Chiang Mai). The trip was first spurred by my mom, who is going to visit the Philippines in time for a festival and other reunions in her hometown, and Thom and I decided to tag along, as we similarly did this time of year in 2007. It’ll be great to see a bunch of my relatives again. This time, to add some variety, after one week in the Philippines, Thom and I decided to plan a side trip and are going off on our own to some neighboring countries that neither of us have been to before: Siem Reap for the temples at Angkor, and Chiang Mai, one of the ancient cities of Thailand. Quick airline geek-out: our total flight plan to and from SFO and within Asia covers about 18,862 miles on four different airlines–all of which I’m flying for the first time–on aircraft ranging from a Boeing 747 jumbo jet all the way down to an ATR 72 turboprop. And the way it works out, in the middle of the trip we’ll even have a stopover in Singapore, just long enough to see a few sights and rest before continuing on. Map time! We’ll likely have Internet access for most of the trip, so I will try to at least update status when I can. ‘Til next time! 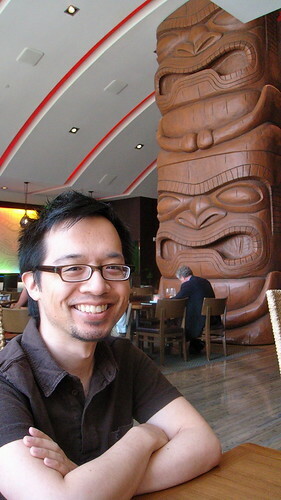 Aside: That song will always remind me of our vacation in 2007 to, of all places, the Philippines. 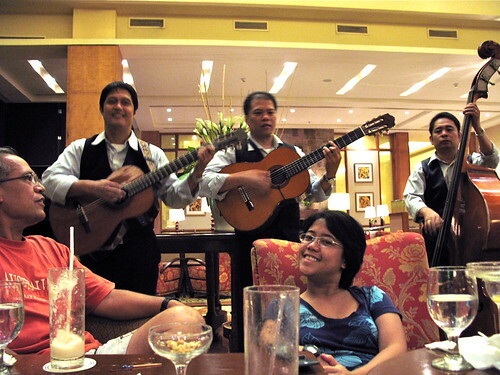 A bunch of us were having drinks at the Taal Vista Hotel in Tagaytay, being serenaded by a roving trio of guitarists. We talked to them a bit, and when they learned that Thom was from Virginia, they broke out into “Take Me Home, Country Roads”! Ha! We were all singing along; it was great. 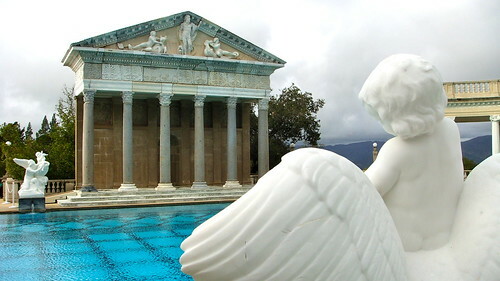 Oh, wait, I just dug through my photos of that trip (which I still haven’t uploaded completely to Flickr! ), and found one of the players: so it was two guitars and a bass. That’s my uncle and cousin in the foreground. Good times.